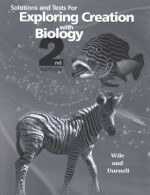 Solutions and test for Exploring Creation with Biology, Apologia's award-winning, college-prep biology course that provides a detailed introduction to the methods and concepts of general biology. The softcover solutions-and-tests manual contains answers to module study guides, tests, and test solutions. A booklet containing an extra set of tests is shrink-wrapped with the manual. A softbound solutions and tests manual, which contains answers to review questions, practice problems, tests, and test solutions. One test packet is included with this manual.